If you decide that you want to become a chef there are various roads to take to get there. Not all of them involve formal training but for many of the better, jobs that are more prestigious will require qualifications consider you for a position. One of the best options for this formal training is chef school or culinary school. To learn to be a chef, you can take a position in any establishment and rise through the ranks with hard work and available opportunities. However if you want a more rounded start to your culinary career, then this can be given at culinary schools. Culinary school learns students a lot more than just to grill a steak; courses include language and history, food science, business management and marketing. Specialist areas such as pastry and baking classes will cover the basics of making pastry and also what the different elements are. There is also more to being a chef that just cooking. Chef actually means ‘chief’ and the head chef is the head of the kitchen. The top chef’s job will include a whole range of jobs such as organising menus and wines, organising staff in their various jobs and overseeing some of the financial side of the restaurant. Chef school will not suit everyone and there is nothing wrong with this. The job itself is physically demanding with long hours on your feet and these jobs are far from the best paid in the world. Added to that, attending chef school added a rigid perfection to the job that makes it a difficult proposition and only for the most dedicated. The Bureau of Labor Statistics showed that in May 2011, only the top 10% cooks earned more than $15.46 per hour. What are the best chef schools? There are a number of different ways of rating which is the ‘best’ of the culinary schools around the country. 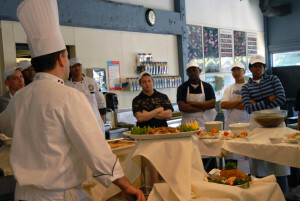 Bourdain’s for example list the Culinary Institute of America, Johnson and Wales and the French Culinary Institute are the leading schools. However based the success of chefs from a school, importance of work-experience and who’s chefs have gone on to succeed at top jobs, these three wouldn’t be the only ones. These are just the top ten and there are a range of others not mentioned here covered areas such as Oregon, Vermont, Kentucky and Nevada. So wherever you are in the country, there are places to study if you decide that chef school is the route for you. Once chef school is finished and you have a job, there is plenty of on the job training that you will go through as part of your daily duties. However, there are also continuing paths in education that can be taken to add to your qualifications. The main portal to access these additional training is through groups such as Chef 2 Chef Culinary Portal or the International Association of Culinary Professionals. These are a source of both further training, as well as a chance to meet up with fellow professionals, exchange ideas and recipes as well as meet chefs that are more experienced and learn from their experience. These groups often offer career support and leads to jobs if you are currently out of work or looking for a new challenge. Being a true chef, as opposed to someone who cooks for a living, is a job that requires dedication and application. It is rare that you will reach a lofty position such as Head Chef in a matter of a few years so be aware that when you start out, this is the beginning of a long journey but hopefully a successful one. Previous post: How Long Does Dry Ice Last?